So there you are, doing a health and safety audit of a museum on your university campus. You ask about chemical exposures and the staff brings out its inventory and SDS files for the current materials used in preservation. Later, the collections manager takes you on a behind-the-scenes tour and proudly shows you some centuries-old, rare botanical collections. You think to yourself, “Gee, if it’s that important, why don’t they clean off the dirt?” It doesn’t occur to the museum staff to mention that the “dirt” is a reaction of sulfur in the mounting paper with elemental mercury released from mercuric chloride treatments on the original plant specimen. If these two professional communities spoke the same language, the auditor might have made the connection between that age-old pesticide treatment and the threat of current mercury vapor accumulation in closed storage cabinets. Collections hazards are not intuitively obvious to the practicing industrial hygienist or safety professional. As an “industry” at risk, the collections care work force is still well below the public health radar screen. Yet, collections can be found in every museum and art gallery, as well as in botanical gardens, park service historic sites and wildlife refuge centers. Even a university campus without an affiliated museum will still have treated specimens as a major part of its teaching collections. THE POPULATION AT RISK Supportive operations have risks similar to other occupational settings, such as facility maintenance (albeit of landmark status buildings with asbestos and lead-based paint), exhibits fabrication (woodworking and graphics shops), and laboratory research. Physical plant employees also operate a variety of powered lifts in very tight spaces and in close proximity to priceless artwork. Editor’s note: As explained elsewhere in this issue, AIHA and the American Institute for Conservation (AIC) have begun discussing possibilities for collaboration. AIC members are in need of industrial hygiene expertise to manage occupational hazards in their workplaces—museums, libraries, botanical gardens, and other similar facilities. The article below, which discusses the many and varied health hazards faced by members of this profession, originally appeared in the July 2003 issue of The Synergist. The authors have updated it to reflect current information. Adapted from Hidden Hazards: The Dark Side of Collections, 2001 American Institute for Conservation Annual Meeting; comprehensive list published in Smithsonian Safety Manual, Chapter 24: Collection-Based Hazards. Tap on the graphic below to open a larger image in your browser. In a fine art museum, conservators are the front line when it comes to hazard recognition, as they are immediately responsible for the repair and stabilization of the collection. This can involve the use of strong acids, bases, solvents, and heavy metal-containing pigments, as well as X-ray equipment and radioactive isotopes during the conservation dating and examination process. Recently gamma radiation was used to examine the interior of an ancient bronze sculpture. Gamma radiation was chosen by conservators to assist in determining how the sculpture was created and conserved over time. Direct contact with artwork requires protection from cultural poisons (curare, poisonous seeds) and byproducts of decay or fumigants, as well as patinas and dyes. The conservators, the chemists of the art world, are continually trying to determine the chemical processes that were used to create the original works of art in an effort to conserve the work. Recreating the chemical processes can be inherently hazardous. Conservators play an integral part in developing pest management programs for the collection. In conjunction with the environmental health and safety (EHS) professional they evaluate the risks of pesticide/insecticide/fumigant applications and their impact on the artwork, human health, and the environment. A recent anoxic treatment of artwork was a collaboration of conservators and safety professionals to ensure that the appropriate environment was created to control pests and contained to ensure that safe oxygen levels were maintained in the work environment. A different set of challenges is posed by gallery-associated art schools, which are, in effect, industrial facilities within an academic building (complete with foundry, woodshop, and welding shops). Finally, there are the up-and-coming artists of the new millennium who are exploring boundaries and experimenting with art materials ranging from bodily fluids to hydrofluoric acid. With exploration of materials comes experimentation with the application and exhibition, potentially creating a hazardous environment for both artist and patron. A performance artwork featuring a fully operational guillotine, interactive artwork incorporating live animals, and experimentation and exhibition of phosphorescent microorganism are examples of student works both proposed and exhibited. CHALLENGES TO HAZARD IDENTIFICATION Traditional surface sampling methods need adaptation to accommodate conservation handling restrictions on fragile items and cultural concerns for sacred objects. A mixed cellulose ester filter would shred on a rough surface such as a wooden mask. Commercially-available wipes contain surfactants and alcohols that are harmful to the object. Use of a microvacuum technique may solve those problems but may be too vigorous, causing unwanted loss of dyes, markings, or residual organic matter of scientific significance. Portable X-ray fluorescence analyzers for metals, and bag enclosure sampling for residual volatile chemicals, are useful options (any non-invasive/non-bulk sample method is preferred). CHALLENGES FOR EXPOSURE ASSESSMENTS Conservators, curators and collections management staff are a highly independent and skilled work force, characterized by high inter- and intra-worker variation in frequency and duration of tasks. There is potential for acute, but short-term, exposures to solvents in close proximity art restoration, as well as chronic exposure to low levels of particulate pesticide residues during routine collections handling. Any given task might take 30 minutes one day and then not be scheduled until the next week—but then take six to eight hours at a stretch. Faced with this, an industrial hygienist may have few opportunities to sample and may select a worst-case screening survey as the conservative approach to determining controls. However, to ascertain the true health risks, it is critical that sufficient sample size and random selection be considered. Collaborative studies between museum or university health and safety departments are necessary to pool resources and infrequent monitoring opportunities to create a database suitable for generating a statistically valid exposure profile for collection care tasks. 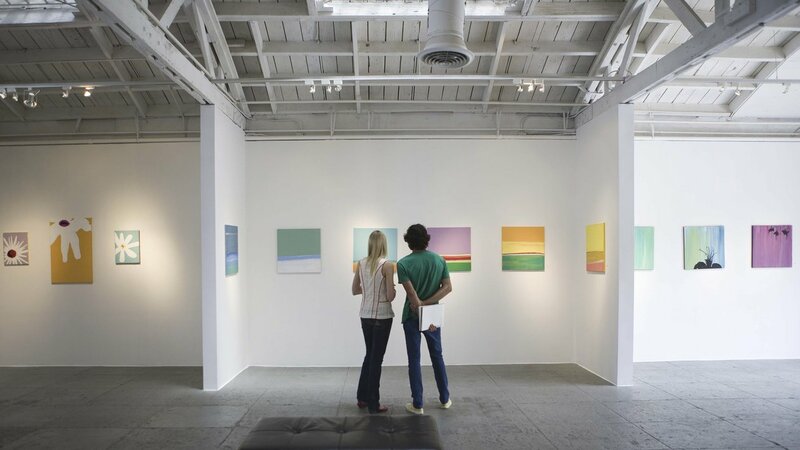 Without such “industry”-wide exposure assessments, a lack of understanding will continue to exist among the museum and fine arts communities as to their occupational risks and the public health resources available to help them manage those risks. To this end, NIOSH initiated a Museum Studies Project, which resulted in several presentations and publications (see “OSH Resources” sidebar). Of added concern is the appropriateness of certain occupational exposure limits for a worker population of widely varied age and health status. Ambient levels of naphthalene in an entomology storage/office area is an example of a situation where community-based health standards may be more appropriate as a basis for creating a new occupational exposure limit. Of added concern is the appropriateness of certain occupational exposure limits for a worker population of widely varied age and health status. CHALLENGES FOR CONTROLS AND RISK COMMUNICATION Product substitution is not exactly an option in museum work. Conservation chemicals may be used in a controlled laboratory setting with the benefit of local exhaust ventilation, but more often than not, private conservators will be applying chemicals for cleaning and restoration in uncontrolled environments such as sculpture gardens and on architectural fixtures. A well-chosen (and fitted) respirator is a staple in most private conservators’ kit bags. They also often rely on creative and copious use of HEPA-filtered vacuum cleaners, protective gloves, and respirators. Conservation handling restrictions become the ultimate challenge in the decontamination of art, historic, or other objects subjected to delaminating asbestos insulation, fires and floods, multiple structural contaminants (as in the World Trade Center and Pentagon destruction), or bioterrorist attack such as anthrax. Since the early 1990s, the Smithsonian Institution has recognized the need to maintain a collections staff cross-trained in hazardous materials abatement and to adapt standard industry practices to the cleaning and clearance of sensitive objects in a way that meets both acceptable conservation and industrial hygiene criteria. The reduction of risk in this work force also depends heavily on frequent hazard awareness training and comprehensive hazard assessments, as emphasized by William Coulehan and Barbara Smith of OSHA in the November 2002 issue of Applied Occupational and Environmental Hygiene. KATHRYN MAKOS, MPH, CIH, retired in 2013 after 26 years as a senior industrial hygienist with the Smithsonian Institution’s Office of Safety and Environmental Management, and is currently a research collaborator at National Museum of Natural History, Washington, D.C. She can be reached at kamakos@verizon.net. MARGARET SKIMINA, CSP, CET, is the associate director for fire protection, environmental health and safety, Art Institute of Chicago. She can be reached at mskimina@artic.edu. , Manager: G. Edward Burroughs, Geb1@cdc.gov Written Materials •Applied Occupational and Environmental Hygiene: “Potential Exposure to Arsenic and Other Highly Toxic Chemicals When Handling Museum Artifacts” (November 2002). •Artist Beware: The Hazards in Working With All Art and Craft Materials and the Precautions Every Artist and Craftsperson Should Take (2005). Recent Publication •Materials Health and Safety for Museum Professionals (2011, available from the AIHA Marketplace). Selected Articles: Exposure Assessments •Collection Forum: “Exposure of Museum Staff to Formaldehyde during Some Wet Specimen Activities” (2006). •Collection Forum: “Oh No! Ethnobotany. The safe handling and storage of hazardous ethnobotanical artifacts” (2003). •Collections: A Journal for Museum and Archives Professionals: A Tale of Two Systems: Synergy in Managing Risks to People and Collections” (2012). •Journal of Occupational and Environmental Medicine: “Assessment of arsenic surface contamination in a museum anthropology department” (February 2013). •MuseumPests 2014: IPM for Museums, Libraries, Archives and Historic Sites: Collateral Damage: “Unintended Consequences of Vapor-phase Organic Pesticides” (PDF, 2014). •NIOSH: “Health Hazard Evaluation Report: Hagerman Fossil Beds National Monument, National Park Service, U.S. Department of the Interior, Hagerman, Idaho” (PDF, 1998). •Taxon: “An Inexpensive Method to Test for Mercury Vapor in Herbarium Collections” (2004). 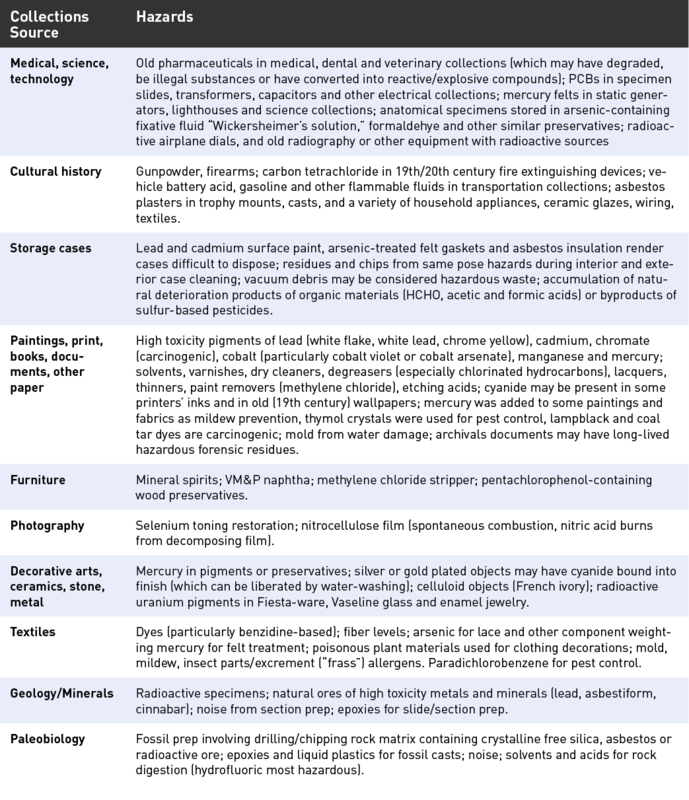 Selected Articles: Hazard Identification •Collection Forum: “The inherent levels of arsenic and mercury in artifact materials” (2009). •Collection Forum: “Historical Survey of the Sources of Contamination of Ethnographic Materials in Museum Collections” (2000). •Collection Forum: “Detecting Pesticide Residues on Museum Objects in Canadian Collections—A Summary of Surveys Spanning a Twenty Year Period” (2010). •ICOMM-CC 17th Triennial Conference Preprints: “Novel Non-invasive Sensors for the Detection of Pesticides on Heritage Objects” (September 2014). •Journal of the American Institute for Conservation: “A history of pest control measures in the anthropology collections” (1996). •Natural History Conservation: “Mercury and Mercury Compounds in Natural History Collections: An Annotated Bibliography” (1990). Access this article from a desktop computer to view a slideshow of images from museum collections.